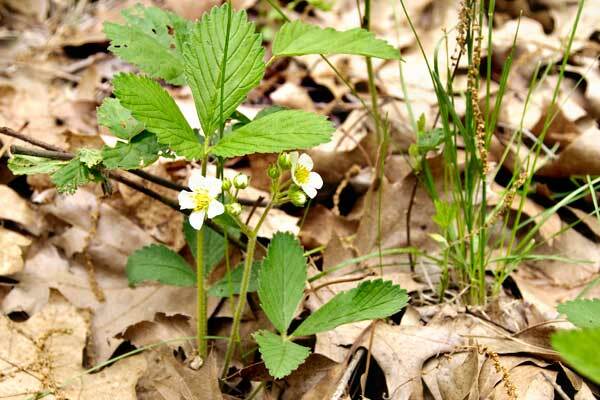 The wild strawberries are in full bloom in the pastures and forest fringes. I’m finding them in places I haven’t noticed them before. The patches I watch each year seem larger, and I’m hopeful that this year I’ll be able to gather enough wild strawberries for a batch of jam. Of course, I hope that every year. The wildlife usually outwit me, though, and leave me only a few to snack upon. 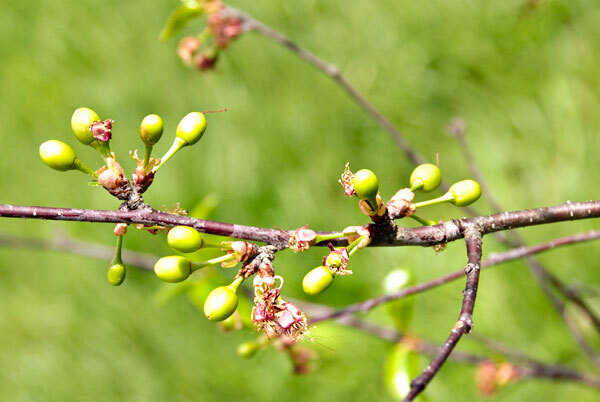 The wild plum bushes are loaded with thousands of tiny green fruits. I’m trying not to get too excited about those yet. Those bushes can be finicky. If it rains too much or not enough, they’ll drop most or all of the developing fruits. The same is true of the Reliance peach tree out in the orchard. Look at those fuzzy little fruits, though. 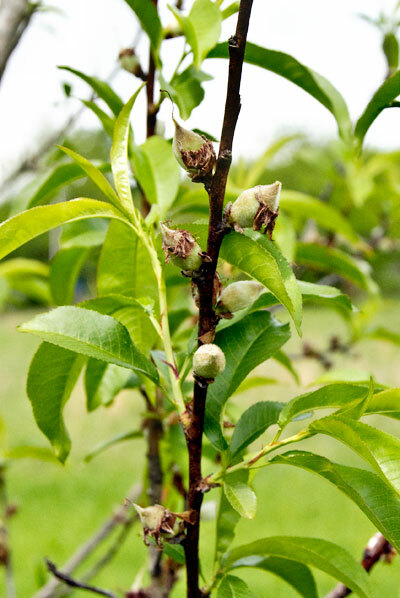 Already I’m fantasizing about warm, sun-ripened peaches, straight off the tree. Nothing in this world tastes better. 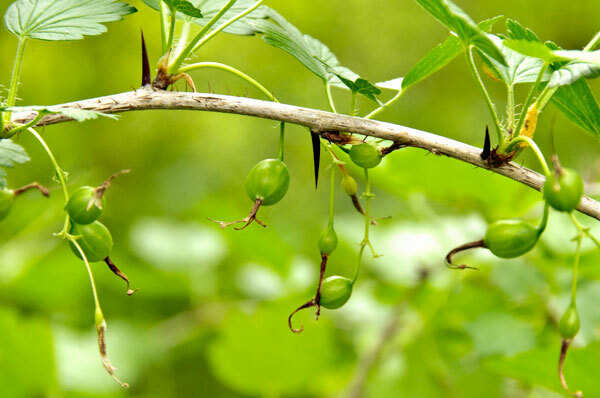 Gooseberries aren’t so tasty and sweet, in my opinion. I don’t care for their odd texture, but I might try making a jelly from the juice this year. Cherries growing on the small Montmorency cherry tree in the orchard. 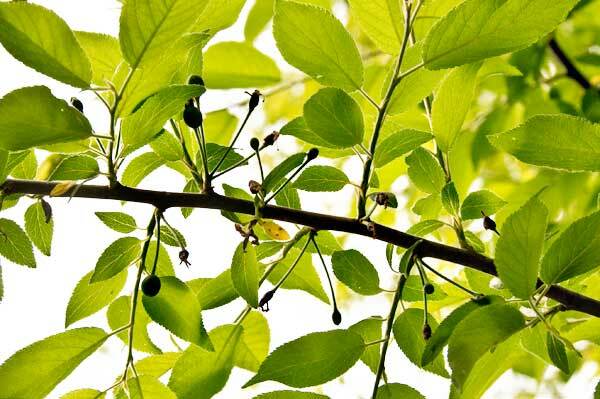 It has hundreds of fruits developing on its branches this year, perhaps enough for a couple of pies. Or a lot of snacks. The tree is conveniently located on the route between the sheep flock’s day grazing pen and their night quarters, plus it’s close to the garden. A handful stolen with each passing would strip the tree of fruit soon enough. I suppose I have little self discipline when it comes to fresh fruit. Can you blame me though? Who could resist such temptations? You can’t outwit that sneaky wildlife!